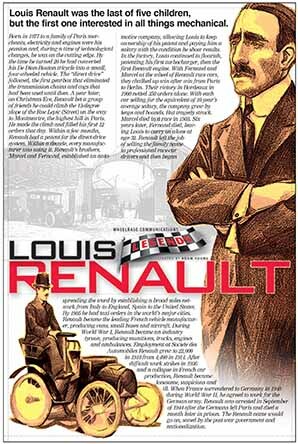 Louis Renault was the last of five children, but the first one interested in all things mechanical. 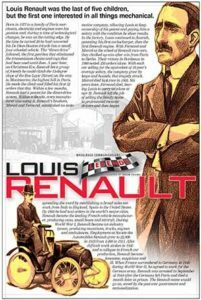 Born in 1877 to a family of Paris merchants, electricity and engines were his passion and, during a time of technological changes, he was on the cutting edge. By the time he turned 20, he had converted his De Dion-Bouton tricycle into a small, four-wheeled vehicle. The “direct drive” followed, the first gearbox that eliminated the transmission chains and cogs that had been used until then.